Scandal-ridden Korean Air chief ousted from board of directors. After years of being mired in controversies and scandals fit for a soap opera involving himself and his closest family members, Cho Yang-ho, chairman of South Korea’s largest air carrier, lost his board seat Wednesday after shareholders voted against extending his term as a director. Although he retains his management rights with shares held by his family, Cho becomes the first conglomerate chief ousted since the nation’s pension fund decided to actively exercise voting rights last year for responsible investing. On Wednesday morning, Korean Air shareholders voted against the airline’s proposal to extend Cho’s term as a board director for three years, with 64.1 percent in favor and 35.9 percent against during the regular shareholders meeting. Cho needed 66.66 percent in favor to retain control. The ownership family of Hanjin Group, which holds Korean Air, is embroiled in allegations of embezzlement, tax evasion, smuggling, assaults and illegal hiring. Cho has been accused of evading inheritance taxes and embezzling company funds. His wife has been accused of multiple assaults on employees, some of which were caught on camera, and illegally hiring foreign housekeepers. His two daughters also underwent investigations by law enforcement last year on similar assault charges. His first daughter Hyun-ah sparked outrage in the “nut rage” incident in 2014 by throwing a fit at cabin crew on her flight. The second daughter was embroiled in a “water rage” incident, for purportedly abusing an employee of a contracted ad agency. The Cho family has become the main symbol of “gabjil,” where those with higher business status abuse their influence over those of inferior status. The scandals have also raised concerns among investors for potentially hampering the airline and further, the group, with high risks associated with the ownership family. The NPS decision was also considered to be in line with global and local advisers and foreign pension services. Earlier, global and local advisers — Korea Corporate Governance Service, Institutional Shareholder Services and Sustinvest — all recommended the NPS vote against Cho’s re-election. Foreign public pension services, including the State Board of Administration of Florida, Canada Pension Plan Investment Board and British Columbia Investment Management Corporation, shared the same view. For the nation’s pension fund, the third-largest in the world with 640 trillion won ($571 billion) in assets, Korean Air was the first company put to the test since the adoption of the stewardship code last year that acts as a guideline for institutional investors to actively participate in corporate governance. The NPS adopted the code under growing pressure to apply stricter yardsticks on their investments, with growing risks from owners resulting in revenue and stock price drops. Cho’s family still retains a 33.3 percent stake of Korean Air and first son Cho Won-tae currently serves as a CEO of Korean Air. The ownership family also has a 29 percent stake in Hanjin Kal, the holding company of Korean Air. 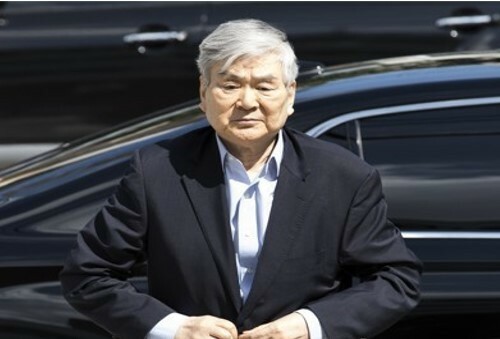 Park Ju-gun, head of corporate analysis firm CEO Score, said Cho’s dismissal as director sends “a significant signal” to Korean conglomerates with the message that owners can also be ousted for wrongdoings. There are currently 297 companies, including Samsung Electronics, Hyundai Motor, SK hynix, Naver and Posco, in which NPS holds more than 5 percent of shares. On Tuesday, the NPS also voted against the term extension of SK Group Chairman Chey Tae-won, citing damage to shareholder rights and corporate value. Chey, on the other hand, was approved to extend his term during the firm’s shareholders meeting Wednesday.